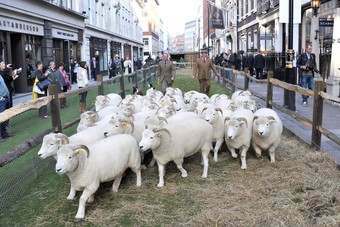 Here's Savile Row, London's most famous street for tailoring, as you've never seen it before: turfed over and being grazed by Wiltshire Exmoor Horns and Bowmont sheep from Devon. It's all part of this week's Wool Week campaign in which a coalition of industry groups and retailers have tried to raise awareness of British wool. More than 50 of the UK's leading brands, spanning more than 400 stores, have been involved - including Marks & Spencer, John Smedley, Jigsaw, John Lewis, Harvey Nichols and Selfridges - with the ultimate aim of encouraging UK consumers to choose wool over synthetic fabrics. Following its UK launch, the campaign will extend globally in 2011 into key fashion markets, including the USA, France, Italy, New Zealand, Australia, Germany, Japan and Korea. Wool Week is part of a wider five-year The Campaign for Wool, which is led by HRH The Prince of Wales. But there's no getting away from its serious message. Even though British wool now makes up 3% of world wool production, with 15m breeding sheep and an output of 35,000-40,000 tonnes of wool each year, the industry is depressed. And prices have fallen so low - ironically driven by some bigger retailers forcing them down - that wool prices don't even cover the cost of shearing on some occasions. If you'd like to take part in the Campaign for Wool, an auction of high-quality wool pieces will take place between 17 October and 10 December. Items ranging from a one-off designed dress by Richard Nicoll to an exclusively created designer rug by Brinton's in partnership with Timorous Beasties. And what better way to support a very good cause.